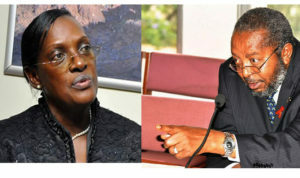 Former Bank of Uganda Director for Supervisions Justine Bagyenda, has Shs19b stacked away on three accounts, making her several times richer than her former boss, Dr Emmanuel Tumusiime Mutebile, who is the highest paid salary earner in Uganda. Sources have intimated to PML Daily that the money was accumulated in six years. Dr Mutebile, the central bank governor earns Shs53.3 million per month. According to statements available, Bagyenda has been banking Shs66.6m per week, making it Shs266m per month between 2013 and 2018. BoU auditors were further shocked on learning that Bagyenda operates both Shillings and Dollar accounts in Diamond Trust Bank, Centenary and Barclays banks on which she is statching away the billions, although how she accumulated all this money has remained subject to lots of queries. Sources reveal that Bagyenda owns account number 5106903903 in Diamond Trust Bank described as ‘low start savings account’ which as of December 01 , 2017, had a total of Shs11.4 billion. “The same account is expecting another Shs429 million on March, 07 2018 when the Shs179 million she fixed in September 2017 at 10 per cent rate matures,” one of the sources revealed. It is also said that by October 21, 2017, her shillings account at Barclays had a balance of Shs98 million, while her dollars account number 5106903904 in Diamond Trust Bank, named Prime Dollar Saving, as of November 20, 2017 had $1,074,450 which, at a conservative Shs3500 exchange rate translates to Shs3.76 billion. Her bank statement does not, however, capture the $315,717(Shs1.1 billion) which, a certificate of deposit shows she earned from a fixed account transaction after she had deposited $176717 on December 29, 2016 at a 4.75 per cent rate. The transaction matured a year later. The same account is expecting US $214,149(Shs750 million) to drop on December 29, 2018 when a US $214149 fixed deposit she made matures. Bagyenda has worked at the central bank for only six years. On top these billions, Bagyenda also owns 20 properties in various parts of the country also worth billions of shillings. The properties include the Land comprised in LRV 2897 Folio 11 Plot N0. 21 at Museveni Road in Ntungamo district, LRV 2897 Folio 12 Plot 19 land at Museveni Road in Ntungamo district, LRV KCCA 86 Folio 22, Plot No. 1-7:53 land at Bugolobi Nakawa, LRV 3553 Folio 23 Plot No.43 Land at Peninsular Road, Kampala Central Division, LRV KCCA 89 and Folio 24 Plot No.50 Land at Kampala Central Division. Others are FVR 629 Folio 11 Plot 5 land at Sunderland Avenue, LRV 2631 Folio 10 Plot No.28 land at Kimera Close, LRV 3255 Folio 10 Plot No.410-411 Land at Makerere Hill Road, Kampala, LRV 2139 Folio 8 No. 20 Land at Balikuddembe Road, Kampala, LRV 2139 Folio 8 Plot 20 Balikuddembe Road, LRV 325 Folio 10 Plot No. 41-411 Block 82 Land at Bugolobi, LRV 2631 Folio 10 Plot No. 28 St. Kizito Close, Bugolobi, LRV 629 Folio 11 Plot No. 5A Block 82 Bugolobi, Block 20 Plot no. 629 Kiwatule, Nakawa Division, Block 20 and Plot No.629 land at Busega, Rubaga Division, among others.